I have been a subscriber of the TED Talks' channel for as long as it has existed. Daily, I am provided with a plethora of information and advice on life from some of the most highly praised minds in existence today. Truly, it's been a better education than the one I paid $100,000 for 12 years ago. TED talks showcase people living by the lessons they teach. They originally came together to share ideas in an exclusive forum, then allowed for their ideas to be shared around the world. Since then, I've been an addict. 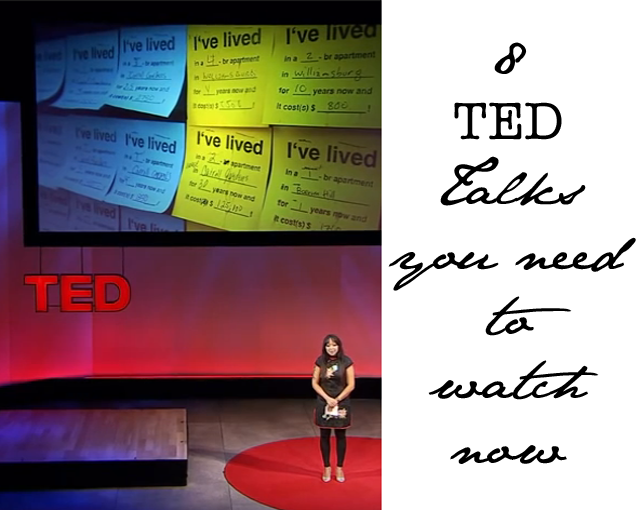 So I thought it about time to share the love and showcase 8 TED Talks that I continue to watch over and over again. Here, in no particular order, are 8 TED Talks that will do everything from challenging your idea of beauty to unlocking your creative genius. My recommendation is to take space in your day when you really can watch each video with interruption. 1. In a time when beauty is defined by supermodels, success is defined by wealth, and fame is deified by how many followers you have on social media, Lizzie Velasquez asks the question how do you define yourself? Once labeled, "The Worlds Ugliest Woman," Lizzie decided to turn things around and create her own definitions of what she defines as beauty and happiness. 2. In her New Orleans neighborhood, Artist Candy Chang turned an abandoned house into a giant chalkboard asking a fill-in-the-blank question: "Before I die I want to ___." Her neighbors' answers -- surprising, poignant, funny -- became an unexpected mirror for the community. 3. "Eat, Pray, Love" Author Elizabeth Gilbert muses on the impossible things we expect from artists and geniuses -- and shares the radical idea that, instead of the rare person "being" a genius, all of us "have" a genius. 4. Neuroanatomist Jill Bolte Taylor had an opportunity few brain scientists would wish for: One morning, she realized she was having a massive stroke. As it happened -- as she felt her brain functions slip away one by one, speech, movement, understanding -- she studied and remembered every moment. This is a powerful story about how our brains define us and connect us to the world and to one another. 5. Tony Robbins discusses the "invisible forces" that make us do what we do -- and high-fives Al Gore in the front row. 6. Cameron Russell admits she won "a genetic lottery": she's tall, pretty and an underwear model. But don't judge her by her looks. In this fearless talk, she takes a wry look at the industry that had her looking highly seductive at barely 16-years-old. 7. Brene Brown studies human connection -- our ability to empathize, belong, love. In a poignant, funny talk at TEDxHouston, she shares a deep insight from her research, one that sent her on a personal quest to know herself as well as to understand humanity. 8. Body language affects how others see us, but it may also change how we see ourselves. Social psychologist Amy Cuddy shows how "power posing" -- standing in a posture of confidence, even when we don't feel confident -- can affect testosterone and cortisol levels in the brain, and might even have an impact on our chances for success.